Parys, South Africa – On Saturday, December 8, the Saddle Seat World Cup sponsored by Impondo Mining and Live 2 Learn concluded with second round performances from the Three-Gaited sections of the Saddle Seat World Cup teams. After a stellar presentation of rail work, the U.S. Three-Gaited team set the stage for leading pattern work scores in both groups. With strong performances all week, hopes were high that both the U.S. Three- and Five-Gaited sections would bring home the Gold medals. The official results were announced at the Closing Ceremonies that evening, and since the rail work scores had not been posted, there was much anticipation of who would claim the Saddle Seat World Cup titles. 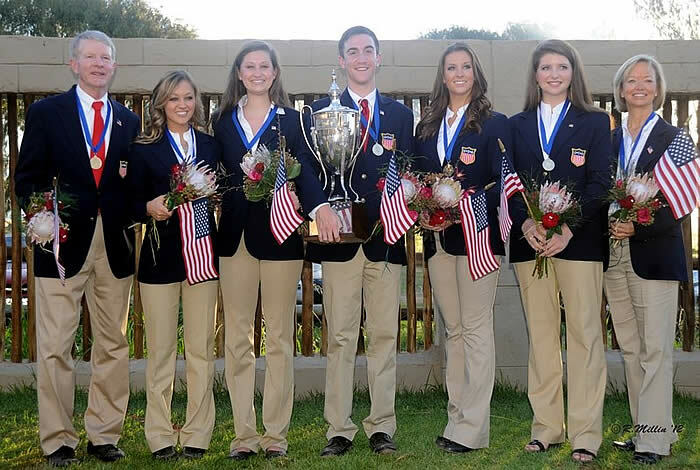 The U.S. riders claimed the Gold medal in the Five-Gaited section, solidifying all of the hard work and support the riders had received over the past year. Coached by Sandra Currier (Belville, TX) and Brent Jacobs (Georgetown, KY), Hunter Chancellor (Evansville, IN), Angela Darrow (Hartland, WI), Drew Taylor Hewitt (Bermuda Run, NC), Ali Judah (Louisville, KY), and team captain Nick Maupin (Sussex, WI) took the podium to receive their Gold medals and the Five-Gaited World Cup trophy, sponsored by Saddle & Bridle magazine. The Republic of South Africa was awarded the Silver medal and Canada received the Bronze, while the teams from Germany and Sweden, in its first appearance at the World Cup since the 1990s, received honorary awards for their participation in the event. The dominance of the U.S. riders was evident as the U.S. Three-Gaited section also claimed the Gold medal. With the guidance of coaches Cindy Mugnier (Belchertown, MA) and Kristen Cater (Dunbarton, NH), and support of David Cater, Kent Swalla, and alternate Kristen Smith (Crestwood, KY), riders Brooke Boyer (Johnston, IA), Emily Chapman (Tucson, AZ), Brooke Jacobs (Georgetown, KY), Alexandra Lawson (North Salem, IN), and team captain Abigail Muturx (St. Louis, MO) boosted the team to a Gold medal and the Three-Gaited World Cup trophy, sponsored by the Republic of South Africa. The Silver medal went to the Republic of South Africa and the Bronze medal went to Canada. 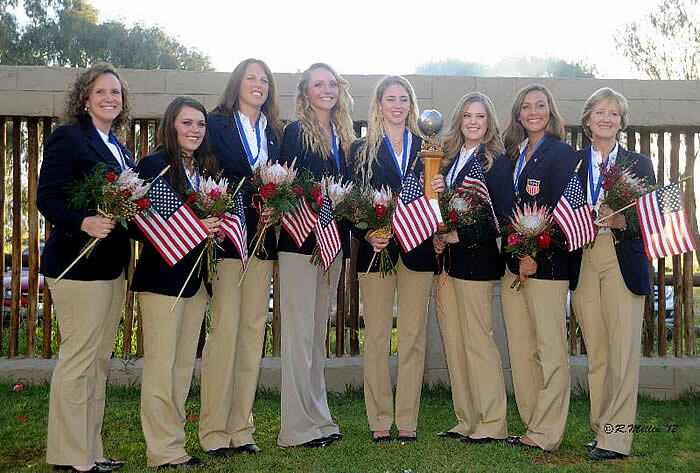 In this first year under USEF, the U.S. Saddle Seat World Cup team won both Gold medals for the first time since 2006. Special thanks to the extended team of U.S. including the parents of the team members and the team supporters who made it possible for this team to achieve such excellence. To see our valued supporters, please visit: http://www.usef.org/_IFrames/breedsDisciplines/discipline/allsaddleSeat/TeamSupporters.aspx. Competition footage from the week is available here. For more information, please contact Lori Nelson, USEF Assistant Executive Director, National Affiliates, at lnelson@usef.org.